We are very graeatful to the h.h. franklin club from New York www.franklincar.org for allowing us to use the following historical informations and pictures below. „H.H. 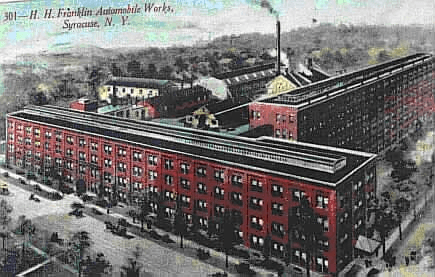 Franklin Manufacturing Co.” began in 1893 in Syracuse town, New York state, USA. Factories was created by Herbert H. Franklin i Herbert G. Underwood (inventor), for production of die-castings. Mr. Franklin invented the term die-casting. In 1898 John Wilkinson builds prototype of 4-cylinder engine designed as a first in long line of perfect, air cooled engines. In 1901 H. H. Franklin and J. Wilkinson establish cooperation for designing and building Wilkinson car. 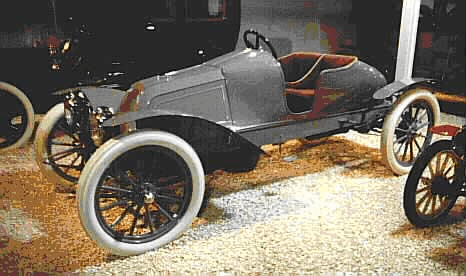 In 1902 the first Franklin production car „Runabout” was sold. 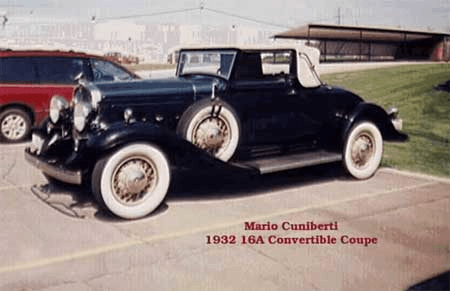 It had 4-cylinder, overhead valve piston engine, installed transversely, in front, with the first float carburettor and first controlled throttle. Moving forward caused air flow to cool, the same cooling procedure still is used in our times airplanes. 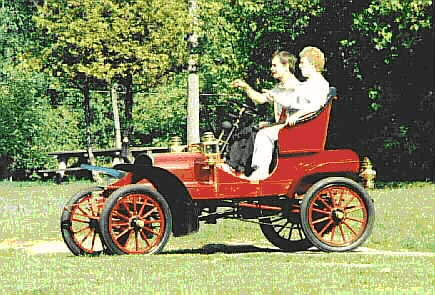 First Franklin car sold in 1902. In 1902 Wilkinson edited in printing his work about „Scientific light weight”, which gave in effect simply, elastic construction, quality and progressive, great ideas, as light construction with low weight of unsprung part and direct engine cooling, which led to many future succeses in speed and reliability competitions. Wide use of wood and aluminium gave Franklin cars lightness and strength. In 1904 small Franklin roadster in 32 days, 23 hours and 20 minutes beats transcontinental record from San Francisco to New York, old one was 61 days. 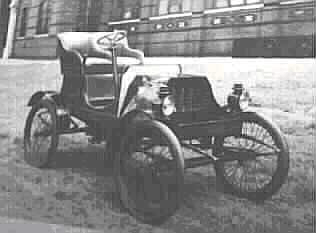 Roadster model „E” from 1904. In 1905 first car with 6-cylinder engine was manufactured in America. It had Franklin’s engine set along. Air cooled, upper valve construction – these are two features, which Franklin pioneering implemented with great success in 4-cylinder engine, couple years before. Cooling with air eliminated needs of 177 complicated parts of water cooling system. In 1906 August- 6 cylinder Franklin splits half old record from coast to coast, beating way in 15 days. In the same year automatical lubrication invented by Franklin engineeres solved problem of „the correct oil amount to the proper point, at the right time”. Drive through the springs was introduced by Franklin as an important element in flexible construction. Strains of starting and stopping were cushioned by applying the driving force through the rear springs. In 1907 Franklin as first implemented the automatic spark advance for secure maximum engine efficiency. Also in this year statistics showed that H.H. Franklin Co. uses biggest amount of aluminium for car production, lorry and die-castings. In 1908 implemented hemispherical burning chambers in cylinders, it was next „new idea”. In 1911 invented deflected engine cover with good air flow shape, good for direct air cooling, in 1912 oil circulation preasure system – Franklin implemented it as first one. Year 1912 – fast Franklin’s car from 1911 beats world record of economical fuel run out – 83,5 mpg (35,5 km/l). Also in this year Franklin becomes pioneer in closed body (sedan type). Heating income air with fumes he implemented as first one. Speed Car, „M” Model from 1911, which set fuel run out record. In 1914 in national economic run out of fuel test 94 cars from standard Franklin production had 32,8 mpg (13,9 km/l) average fuel use. Next in 1917 national test with 179 cars from Franklin standard production, gave new record 40,3 mpg (17,1 km/l). Company war production is also 1-cylider generator engine and parts for aircraft engines to Hispano-Suiza and Rolls Royce. In 1921 engine cover was redesigned as it looked like radiators in other cars. Purpose of it was modernization, but also better sales. In 1925, after some tries to improve sales, main part of body was changed, radiator was again redesigned, it looked very conventional and classic appearance. Cooled with air Franklin’s engine to Airman Limited car, including many fixes in matter of power and efficiency. In 1928, after further cooling efficiency modifications, Cannon Ball Baker drove Airman Limited 14,2 mile (22,85 km) up famous mountain road Lookout Mountain in Tennessee and returned in amazing time 20 minutes and 52 seconds, beating new record up and down with average speed 40,8 mile per hour (65km/h). Franklin covered this distance with average speed better about 4,6 mile per hour (7,4 km/h). In 1929 horsepower and efficiency gains enable a Franklin at the hands of Cannon Ball Baker to set a new coast to coast record of 69 hours. Chassis of Franklins car from 1929. 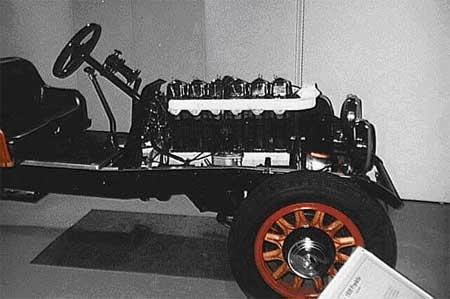 In 1930, new engine model gives biggest power indicator for 1 cubic inch capacity in America, after Deusenberg. New engine flies also in biplane Waco. Pirate Phaeton from 1930 year. 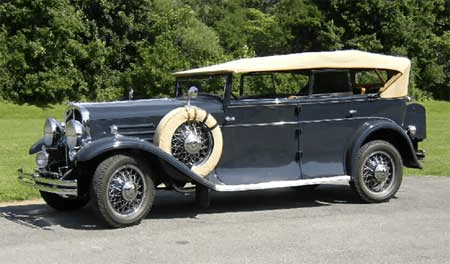 In 1932 The big V-12 (150hp, 398cid) is introduced – again direct air cooled. Also was introduced Franklin Olympic , mating the 100hp 6-cylinder engine to a Reo Flying Cloud. At 3500 pounds, it’s the muscle car of its day. Coupe with collapsible roof from 1932 roku. In 1933 Carl Doman and Ed Marks, ex-Franklin engineers, start Doman-Marks Engine Co. They produce another leap forward – the „Domark” heavy duty air-cooled industrial engines. In 1934 car production ends as H.H. Franklin Co. is bankrupted in the Great Depression. In 1937 Doman-Marks Engine Co. buys rights to Franklin. Domark engines now called Franklin, and name changed to Aircooled Motors Corp.
Franklin flies again. 4-cylinder opposed air cooled automotive and aircraft engines developed. Most parts are common to both types of engines. These are among the first successful opposed engines – standard on all future light aircraft. They pioneer the use of some equipment which the industry finally adopts decades later. In the end of 30’s and beginning of 40’s Franklin was classified to „big three” flying along, opposed engine producers, besides Continental and Lycoming companies. First modern opposed 6-cylinder engine was built in 1940 and it is part of the second generation of Franklin aircraft engines. Today they would be called modular engines. 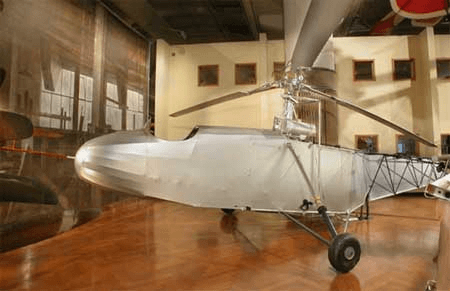 1940 4-cylinder engine powers Sikorsky VS-300A, the first practical helicopter, and a pair of sixes propel the first Nothrop Flying Wing, the N-1M. In 1941 Franklin started to product 4 new engines based on cylinder(4,25 inch Ø on 3,5 inch piston stroke. – 4-cylinder 4AC-199 – 6-cylinder 6AC-298 – 8-cylinder 8AC-398 – 12-cylinder 12AC-595 American Air Force gave engine 6AC-298 mark 0-300. These engines were produced to 1945. Further Continental engines recieved the same military mark. Interstate S-1 Cadet with Franklins O-200 engine. 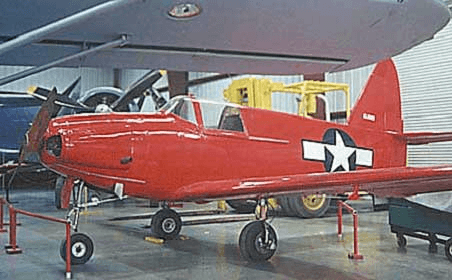 In 1940 Interstate Aircraft initiated monoplane S-1 Cadet for civil training program. USA Army ordered 250 modified S-1s, marked as L-6, which equipped with Franklin 0-200 engine with horsepower 100KM. They were set for communication and watching purpose. When Air Force of USA announced need for radio controlled, excerise airplane. Culver proposed modified model of Cadet (sport plane), which Army bought as PQ-8. Successor of it was bigger and faster PQ-14. Planes could have been controlled by radio and also by pilot. They had Franklin’s 0-300 engines. There were 2000 airplane built of this kind. 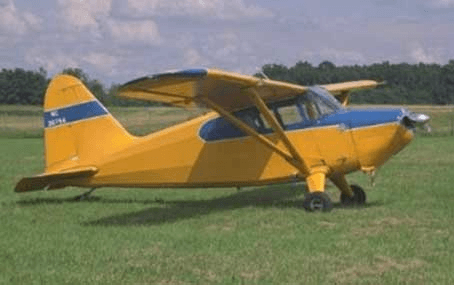 Culver PQ-14 Cadet with Franklins O-300-11 engine with horsepower 150 KM. From 1946 thousands of engines are built in this and following years to power helicopters and light airplanes, including the first certified civil helicopter. Franklins power 3 out of 4 helicopters built over the next decade. In 1947 Franklin engine is used as Auxiliary Power Unit in the Northrop YB-49 jet powered flying wing. In 1948 Tucker Industries buys Franklin (Aircooled Motors, Inc.) to start production water cooled engine for Tucker car. 178hp helicopter engine is fitted with water jackets. From 1960 All 1925 series 11 and later Franklins but the Olympics are designated Classics by the prestigious Classic Car Club of America. 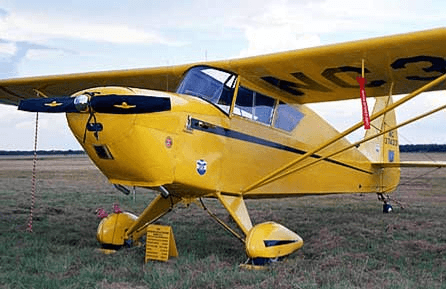 70’s – 6 cylinder Franklin with horsepower 220KM is wide considered for bes engine to light planes ever built. Stinson Model 10A with Franklin 4AC-199 engine. 1992 Aircraft engines and parts once again become available – from Poland. 1992 First official gathering of Franklin car and aircraft engine enthusiasts during 23rd annual HHFC Westrek at Hemet, Calif., airport. 1993 July 4th – 100th anniversary of the H.H. Franklin Manufacturing Co.